Shagway Arts Barn is located near Hamlin Lake, just 7 miles north of Ludington. The Barn sits on forty acres of beautiful land, surrounded by woods and fields. This is what makes the Shagway Arts Barn such a unique venue for weddings and other events. 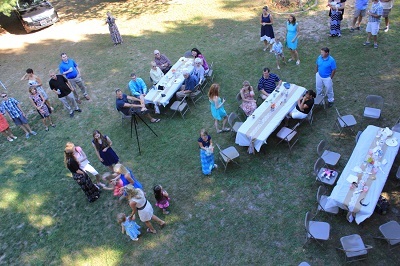 It's the perfect location for a rustic wedding or other events, large or small! The Shagway Arts Barn isn't a regular old barn. There's no hay, no animals, and no farming equipment. It's clean (as clean as a barn can be!) and recently restored, yet still highlights the beautiful, historical elements that makes it so charming. Inside the barn, you'll find all kinds of art from over 30 local artists. This makes for a very creative, unique setting for special events. You can rent the barn to use for your event. 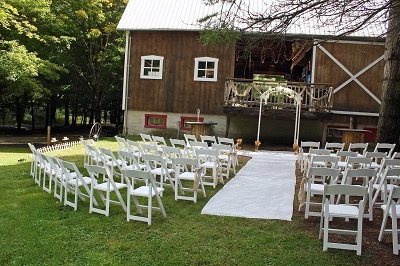 The barn even has an outdoor, attached deck, which is large enough to use as a stage for a small wedding ceremony. The guests can either sit inside the barn, or outside on the lawn. There is also a loft inside the barn, which would be a nice setting for creative photographs. Surrounding the barn, you'll see some lovely fields and wooded areas. There are large, open areas close to the barn that work very well for event tents and parking. You can even enjoy several trails through the woods and fields that are regularly mowed and maintained. Also on-site is a handicap Porta-Jon. For large events, a second Porta-Jon will be available. A professional sound system is also available to use if needed. In-person tours can be arranged with the owner of the barn, Nancy Miller. The barn is open to the public seasonally from May-October. Arrangements can also be made to tour the barn during the months that the barn is closed, depending on conditions and weather. Have Your Event at Shagway Arts Barn! Whatever size event, you can have it at Shagway Arts Barn! From large weddings to small birthday parties, you'll find that the barn and surrounding property can be a perfect location for your event. Other events worth considering having at the Barn would be baby showers, family reunions, graduation parties or open houses, and more! The sky is the limit. 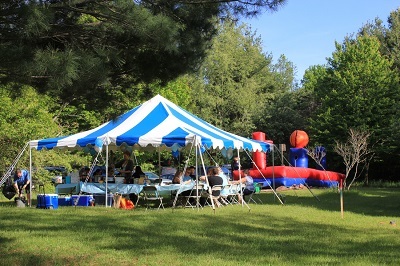 Several areas on the property are available for tents, tables, gazebos, dance floors, grills, lawn games, and inflatable games. The Shagway Arts Barn is one of the most affordable venues of this type around! Weddings and receptions can cost as little as $450 (up to 80 guests). This includes use of the property the day before your event, the day of, and the day after, so there's plenty of time to decorate and clean up. There's no hourly charge. The day of the event, (larger events and weddings only) the barn will be closed to the public. For more information, visit their website. Visit this page for more information about Shagway Arts Barn events, artists, and more.